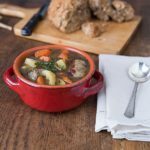 A hearty and traditional Irish dish that can easily be adapted to a slow cooker. This is an easy recipe with Irish bangers and vegetables. Try this with your family on Saint Patrick's day! In a large skillet cook the bacon until almost crisp. Remove and set aside in a small bowl. Cut sausages into three pieces, and cook for about 15 minutes on medium heat until nicely browned. Add the onion and garlic and cook until they are soft. Add the bacon back in. Add the potatoes, carrots, leeks, bay leaves thyme and stock. Sprinkle with cracked black pepper. Cover and cook for about 45 minutes or until the potatoes are tender. Remove from heat. Add in the allspice and let it sit for 5 minutes.